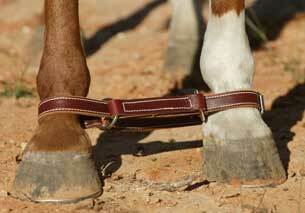 "When there is not a suitable place to tie your horse, hobbles can be a handy way to keep him from wandering away. Braided cotton hobbles are soft around his tender feet and great for hobble training. The adjustable leather figure eight style can be used once your horse has accepted the cotton hobbles."